Last chance to drink Kent Green Hop Beer?! If you’re downhearted about not being able to drink Kent Green Hop Beer for a whole year I have good news for you. Although officially only a Fortnight, which finished last week, the unofficial ‘season finale’ happens in the west of the county next weekend. West Kent CAMRA (Campaign for Real Ale) in association with the Spa Valley Railway (SVR) in Tunbridge Wells hold their annual beer festival from Fri 21st to Sunday 23rd October and it will feature a dedicated bar serving some 25 green hop beers. We always enjoy a pint with Simon Scott of West Kent CAMRA at Canterbury Food & Drink Festival and this year we strong-armed him into writing a piece for us about the delights of the beer festival that offers drinkers one of their last annual chances to drink Kent Green Hop Beer. Here’s what he had to say. We held our first beer festival in association with SVR in 2013, which was the year after the first Kent Green Hop Beer Fortnight. We stocked just over 30 real ales but we decided to embrace green hop beers and served a dozen during the October festival weekend. They proved extremely popular, and as the number of KGHBs brewed has steadily increased each year, this time we’ll have about 25. During festival planning, we quickly realised such a showcase of KGHBs deserved its own prominent place to stand out from the dozens of other beers (the whole festival has grown over the years so the beer list is now at 100+) and ciders. The KGHB bar is located near where festival-goers pick up their beer glasses, and we usually decorate it with hop bines from local producers. Last year the SVR staff even illuminated the barrels with green lights! KGHBs really seem to capture the imagination of drinkers. People comment on the interesting aromas, tastes and even mouthfeel and love the fresh, local produce idea. Some folks even travel quite long distances to sample these unique ales. 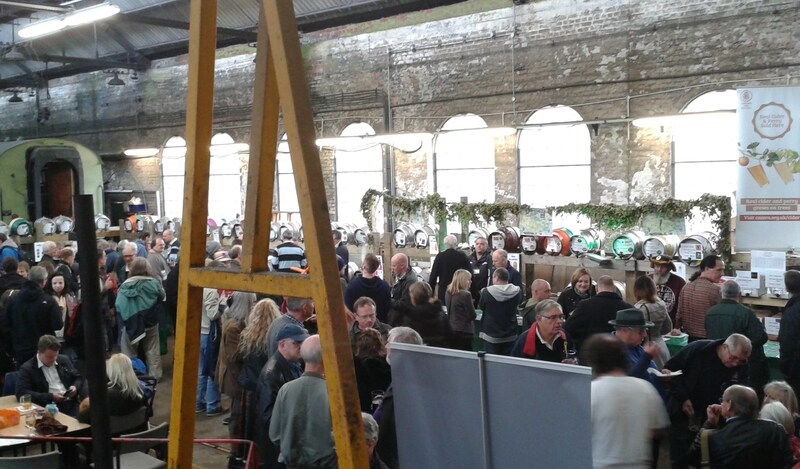 Last year I met people from Cardiff and Derby who had specifically come for the Kent Green Hop Beer! In 2014 the public vote for Beer of the Festival went to Larkins Brewery Green Hop Best and it made us think KGHB deserved a separate competition to highlight the style. So this year KGHBs will be judged by a special panel in a blind tasting on the eve of the festival. If all this beer talk has tempted you to come along to our festival, let me tell you a little more about the event. Firstly, the venue. Originally Tunbridge Wells had two railway stations, Central and West. Services from the latter ceased in 1985 and the station building is now a restaurant. But enthusiasts saved the Engine Shed and this is the main festival site. If you’re arriving by train at Tunbridge Wells (Central) you can catch a bus to the festival (get off at Sainsbury’s/Tunbridge Wells West station and exit through the car park). If you want to walk, it’s a pleasant 15 minute downhill stroll. This will also take you through the old shopping area, including the famous Pantiles which is home to the Chalybeate Spring – the spa from which the railway takes its name. A couple of minutes beyond the Pantiles (follow the roadsigns) brings you to the impressive old West Station and nearby Engine Shed, home to Spa Valley Railway. Look out for the distinctive green SVR livery on the building – which is somewhat reminiscent of the Kent Green Hop Beer logo! Once you’re through the iron railing gates, you’ll be confronted by gleaming trains at the buffers directly outside the ticket office. Entrance to the main beer festival is free. Passing the ticket kiosk you enter the cavernous Engine Shed, and beyond the railway memorabilia you will spy CAMRA volunteers ready to furnish you with a beer glass, tokens and Beer Tasting Notes leaflet. Glasses are available in either third, half or pint sizes. There’s a £3 deposit (or can be kept as souvenirs – this year’s glasses even feature the KGHB logo so they’re a must for collectors!). Tokens take the form of coloured plastic discs, representing various coin denominations – which helps speed things up at the bar. With glass, tokens and all-important Tasting Notes leaflet in hand you’re ready to quench your thirst. The section of the bar next to the glass stall is where you’ll find most KGHBs. All the green hop beer leaflet information is printed in green – so it’s easy to spot. As well as the highlight that is Kent Green Hop Beer, we serve different beers (and ciders) at each of the two railway stations along the SVR line (Groombridge and Eridge, on the national rail network). There are also different beers available on various trains. The station location of each beer/cider is indicated in the Tasting Notes. Part of the fun of the weekend is to travel up and down this restored railway line on heritage trains (steam and diesel), but for that you need to buy a ticket. Tickets for trains after 6pm are discounted if you fancy a bargain. There’s also hot food and snacks at the stations, live music in the Engine Shed and roving morris dancers. What more could anyone want? Thanks to Simon Scott for writing the above. 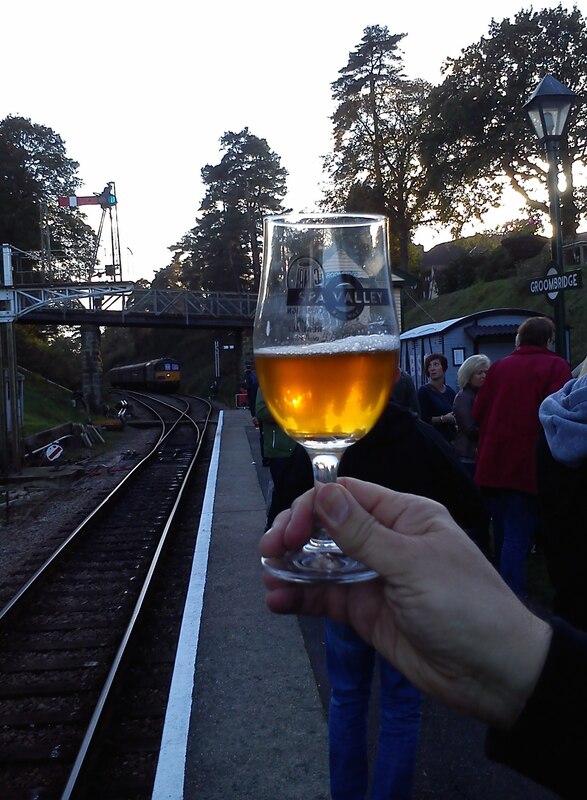 Spa Valley Railway and West Kent CAMRA beer festival runs from Fri 21st – Sun 23rd Oct 2016. Find more details about Spa Valley Railway here and the beer festival in association with West Kent CAMRA here.